Have I told you how much Fun art journaling is? But it's not just fun. It's insightful. It's a place to give full expression to your heart, your emotions and your thoughts about life. And you can get a specific and as general as you wish. I find art journaling to be a powerful subconscious tool since it can combine many elements together, such a color, texture, image, words, and layering of things that can be meaningful in ways that go deeper. I like it when I go deep. Although it can be a challenge to assimilate what I learn since the deeper you go, the more insightful it gets. When you receive insight about yourself, you may recognize areas you need to change, And we all know that change isn't easy. But it's necessary if we are to grow into Who We Are every day, right? So, art journaling is, for me, a great way to understand and know myself in such a way as to create authentic positive change. For this spread, I started with a stencil. I recently purchased alpha and numeric stencils to use in my art journaling, and lately I've been experimenting (love to experiment!) with sprays. I've been putting pigment in water in a little spray bottle to see how well it works and how dark a color I can get with it. That's still a work in progress. I like the way the leaf stencil came out. I used a cosmetic sponge to apply the watercolor paint. I just have to watch I don't use too much water otherwise it gets under the stencil. It really is all in the experimenting! I learn as a go, and I have fun at the same time. 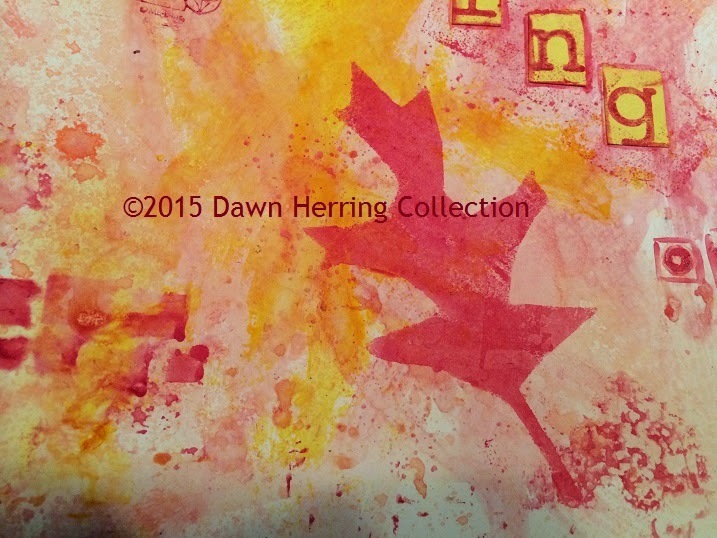 (That's my mantra in art journaling, isn't it? 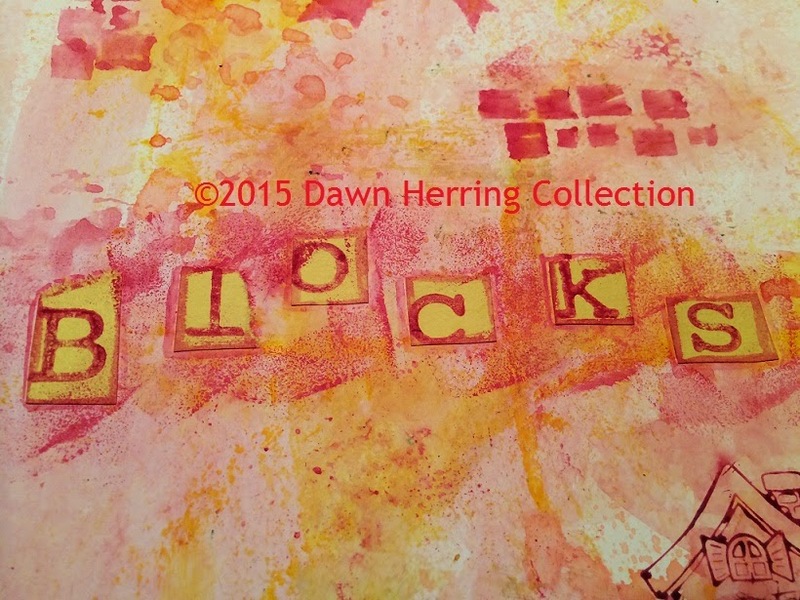 ;)) Once I had my stencils work in place, I noted that the squares reminded me of building blocks. So I decided to add the words, Building Blocks, using colored construction paper as background and I would stamp each one with a letter. I had to determine where the blocks would go. There are so many variables based on what's on the page already as well as what looks right. Once I settled on the 'where' of it, I adhered them with matte medium, and then stamped the letters. Once I had that completed, I felt like the yellow was a bit "loud," so I decided to tone it down a bit with red watercolor paint applied with a sponge and then later, outlined with a paintbrush. I also decided to add more building blocks to the page by cutting out squares of paper, laying them out in such a manner as to resemble bricks, which I later outlined in white and red on yellow. Once I had that completed, I begin to think more deeply about the Building Blocks of life. Not only do our homes get built with a strong foundation, but our inner lives have one as well. But what are those building blocks made of? Joy and Happiness are wonderful building blocks created from lovely life experiences we have. But what about those life challenges that throw us off our center or make us look more carefully at our choices? Ah yes, those! They have so much to teach us, don't they? What triggered that initial reaction or action on our parts? What can that tell us about ourselves? I'm always one to dig deeper in my journal when I ask myself such questions so I can learn what I can to make that all-essential positive change. Know what NOT to do next time and what TO DO for my health and well being. So as I asked this question, I decided to add 'Life Challenges" to my spread, using a stencil for the lettering, which I applied with watercolor and outlined with white gel pen. I am all for realigning with Who I Am, since I know when I am thrown out of alignment from life challenges, it doesn't feel very good. No. And who wants to stay there anyway? Not a very healthy place to be. My journal and art journal are both places that help me stay aligned and help me re-align when needed. Are you facing a life challenge that has thrown you off your center? Have you been blindsided by something unexpected and are smarting because of it? 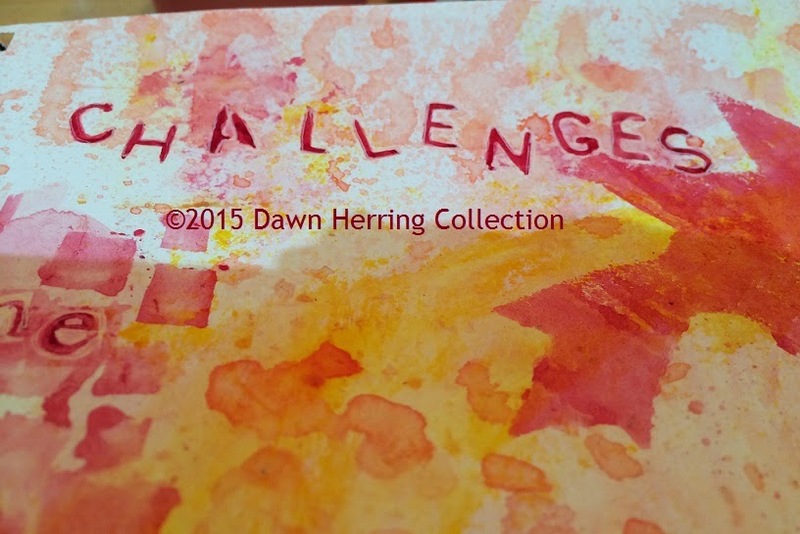 Explain in detail this challenge in your written journal, including what triggered the challenge, how you reacted to the challenge, and what made you realize it threw you off your center. What did you do or still need to do to get realigned? What positive change do you need to make as a result of this life challenge? 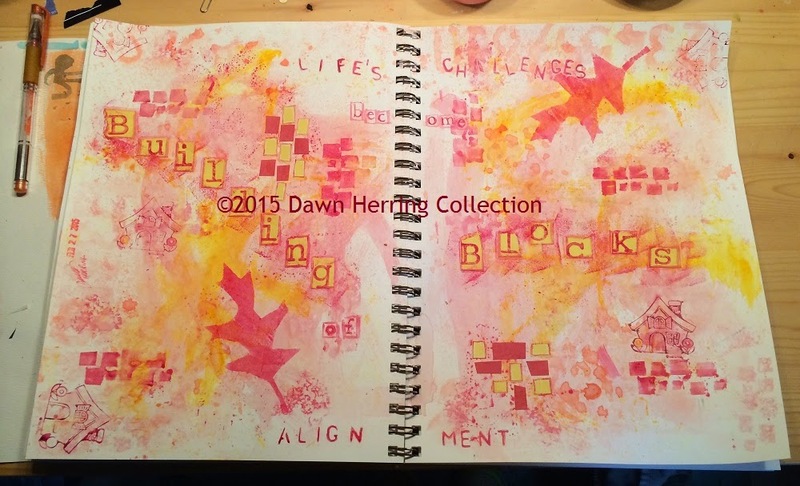 In your art journal, use the color that most represents this challenge for you and apply in a way that Honors your emotion and your feelings right where you are. Pull text from magazines or simply write words that express those feelings best visually. You can also use an image that best represents what this challenge is telling you about yourself. You can also write a poem that Honors the Positive Change you are implementing as a result of this life challenge you have experienced. Validating and Honoring your emotions and Who You Are in a Life Challenge is essential to help you go deeper in understanding how your life works for you and what you can do to make it the best quality of life you can. Remember that those Life challenges can be the Building Blocks to the Life You really want. Don't be afraid to go for what Aligns you with Who You Are from the inside out. Note: I have included a link to my new Refresh Daily blog where this post was originally created. I wanted to be sure you received this post since you are a reader and subscriber to this For A Fresh Perspective Blog. However, I am not posting every Refresh Daily post here. If you want to get all of my blog content, you are welcome to subscribe to Refresh Daily.